There appears to have been 3 or more different adaptations of the Blue Streak theme manufactured by Exhibit; both before and after World War 2. This one was last operated in commercial service on Rampart Street in New Orleans in 1939, substantiated by the presence of all tax and license stickers from the city up to that date. The blue paint is original (although faded) and the silver paint is proper for this model. 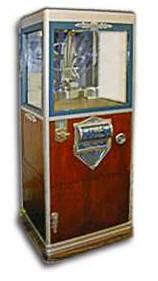 A publicity photo of this same model in a 6-side cabinet verifies the artistic treatment of walnut veneer, blue and silver paint. There is an animated background consisting of a sprocket and rocker arm which is typical of most of the pieces of this model series. The sprocket and rocker arm move in unison with the crane boom and claw during the game cycle, but actually have no necessary connection to the operation of the mechanical mechanism. This as-found unit was considered too original in condition to benefit from restoration and it now resides, as shown, in a private collection along with 2 other valuable machines of the same Art Deco era.